The Firefox web browser displays a "search with" or "visit" entry as the first suggestion whenever you type something in Firefox's address bar. The suggestion depends on what is being typed as well as the Firefox bookmarks and browsing history. If a web address is the first match "visit" is displayed while "search with" is suggested whenever an url is not the first match. Mozilla calls this unified complete, and it has been designed for a number of reasons such as better identifying searches among results or always highlighting the enter/go action to the user to make it clearer in the process. The main issue that I have with the highlighting of the action in the first row of suggestions displayed by Firefox is that it feels redundant. Firefox displays the suggested address directly in the address bar, and the visit suggestion underneath reveals the same information. While some users may confuse searches or addresses, it is easy enough to distinguish them as addresses always come in the form domain.ext/ while searches usually not. In addition to being redundant, it is taking away a spot for a match that would otherwise be displayed in its place. It is thankfully easy enough to disable unified complete in the Firefox browser. Install Classic Theme Restorer from Mozilla's AMO website. Load about:addons in Firefox's address bar afterwards. Click on the options button next to the Classic Theme Restorer entry. Select Location bar (3) from the list of options. Check "remove 'search with' and 'visit' items". Install the Stylish add-on in Firefox. Install the URL Bar Tweaks - Remove Visit/Search & Scroll bar style from this site. Load about:support in Firefox's address bar. Click on the show folder button on the page that opens. Locate the chrome folder. If the folder does not exist, create it. Locate the userChrome.css file inside the chrome folder. If it does not exist, create it. Paste the following content in the file and save it. Restart Firefox afterwards. Enter Selects is a simple add-on that selects the first "real" entry when you type something in Firefox's address bar and hit the Enter-key afterwards. It jumps over the search with or visit row automatically, and is designed specifically for Firefox users who have always used the Enter-key to load the first result. Word of caution: While I have not noticed any issues disabling it, it is possible that Mozilla will add more features to unified complete in the future which would not be available on systems where the feature is disabled on. Confirm that you will be careful if a warning prompt appears. Use the search at the top to find browser.urlbar.unifiedcomplete. The change is active right away, and if the preference is set to false, you have done away with the first row suggestion "visit" or "search now" actions. You can restore the feature at any time by repeating the steps above. Make sure that the preference is set to true in the end as it means that unified complete is once again enabled in the Firefox browser. Find out how to turn off the "search with" and "visit" suggestion that the Firefox browser displays when you type in the address bar. While this new “feature” itself is annoying I also found that this makes the Oldbar add-on behave erratic starting with FF 43 when one wants to select a site from the drop-down history using the keyboard. So disabling browser.urlbar.unifiedcomplete fixes two things in one go for me…. This also resolves a regression in Foobar. Thanks for the tip, Martin. This was bothering me as well. Nice maybe for newcomers but confusing for others. One extra-line to my user.js file. I see I’m not the only one who found that feature annoying. Thanks, Martin. Thank you, Martin. This was especially irritating. Another post of series “how to revert yet another stupid change in Firefox”. Thanks Martin. I forgot about this setting . i decided to put this on user.js. But under ff nightly – appears #urlbar-search-footer-“change shearch settings” . I use the Omnibar extension, https://addons.mozilla.org/en-US/firefox/addon/omnibar/?src=search. Even though browser.urlbar.unifiedcomplete was set to true, I don’t think I was seeing the behavior described in the article above. Thanks, I have the special text files of how manually fix all those Firefox screwups that I got d\from this websites. I like the new feature. 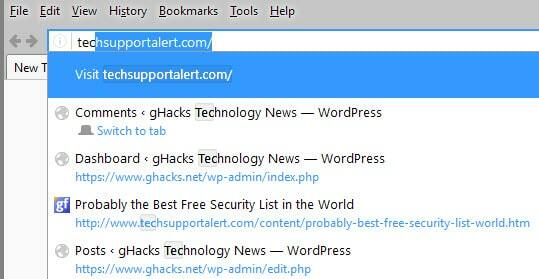 I use keywords for the bookmarked pages I frequent, like “gh” for GHacks.net. When I type the keyword, I now see the URL; it confirms that I typed the correct keyword. I don’t like the autocomplete feature when I’m typing a keyword. It’s annoying. I need to hit Delete or Backspace before hitting Enter. Started my computer today (Linux Mint), and this setting returned to true. Haven’t added any addons or anything else. It’s possible that I had a second window open on a different virtual desktop or something, but just thought I’d note that I had to turn unified back to false again. Hope that it’s not a persistent problem. Thank you! This was driving me nuts and finally started looking for a way to remove it this morning. Extremely helpful! Thanx bro……….. Good work Keep it up……………. Thank you! I switched it off because it stopped to offer items from my history. It is the *address bar* so what’s the point? Thank you very much for sharing this tip. Thank you so much, I really need that. I cant stand that it would “search” in the location bar when all I wanted it to show was bookmarks. I have the “search bar” for searching!! Firefox 48 appears to have re-enabled the “Visit” prompt even though browser.urlbar.unifiedcomplete is still set to “false” in about:config. Is there some other setting which will get rid of it? Read the article – there are 3 ways mentioned to get rid of it! Great article, Martin, and thanks for updating to cover Firefox 48. What I particularly found helpful in your instructions for CTR was to “Check “disable height limit”. Other sites I’ve seen failed to mention this, and without doing so, “Check “remove ‘search with’ and ‘visit’ items” will remain greyed out. Small, but important things like this is what puts Ghacks a cut above the rest. I have FF 48.0.1; and the CTR didn’t work for me — I checked item #5 & 6. Does that mean I have to try the Stylish add-on? I really don’t want to install too many add-ons. Do you run any mod or add-on that modifies the urlbar? I don’t know what “mod” is; but I do have the Old Location Bar addon. However when I look at it in Tools > Addons, it shows Disabled. The userChrome.css got rid of the visiturl; but the drop down box is huge and takes up the full width of the FF window — instead of dropping down from the URL box. I also find that deleting the userChrome.css does NOT reverse what was done by that css. So how do I revert to the “original” before I applied the userChrome.css? Looks like your reply to “Self” may have been my problem also. I was running “Old Location Bar”. Once I disabled that, I don’t have the visit line in url completion anymore. Thanks again for your info, Martin. Thank you so much for this help. WHY does Mozilla keep forcing things back on us that we have already indicated we do not want? I did the original fix (the unified complete setting). All worked well until Firefox 48. Then I followed the above advice which worked. Until today where I now have Firefox 50 and they have broken it *again*. Any ideas how to turn it off this time? browser.urlbar.unifiedcomplete is not found in my firefox. now what!? The preference has been removed in Firefox 48. You need to use one of the other methods listed in the guide. In CTR the option to disable both annoyances has moved to the “Autocomplete popup” tab in the Location Bar menu.